While catching glimpses of local wildlife may add a level of charm that you appreciate, that whimsy quickly fades when your hostas and vegetable plants are suddenly chomped within an inch of their lives. Protecting your gardens and property from animals can make a huge difference in your landscape and protect you from more troublesome issues–like overturned rubbish bins. Luckily, there are plenty of fencing options to help keep the pesky critters out. Depending on your concerns there are several different options, today we’ll go through some of the main disruptors in the DMV area to discuss which fencing type repels them best. Learn how fencing can protect your property from wildlife. To start, the best way to keep animals from becoming a nuisance is to keep them from knowing that you have a food source, to begin with. If you have a solid fence that animals cannot see through they are unlikely to attempt to explore. Likewise, if rubbish bins are kept in an out of sight area and are not overflowing and have lids, raccoons and other animals are less likely to notice them start with. Before you begin installing a fence make sure to check with any homeowners association or local ordinances to ensure you are building within code. 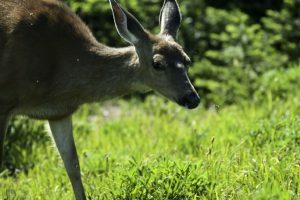 As one of the top nuisances, deer are at the front of the list for animals to keep out of your yard. A fence to keep out these plant gobblers must be constructed high and at a slight angle as they can jump many types of fencing. An eight to ten-foot wall that is flush to the ground will keep most from leaping over or wiggling under. Dealing with tunneling animals presents a unique challenge, they often can remain unnoticed until it’s too late. If you have concerns about these creatures, you may want to add a line of defense underground. The bark of young trees, in particular, is often at risk. To protect them ads a layer of wire mesh around their trunks starting from a few inches underground and reaching two feet up the tree. While opossum and raccoons are less likely to disrupt your plants, they are likely to get into any outdoor items like trash cans, feed bins, and outdoor storage. Because they can climb and dig it can be tricky to find the perfect solution but a floppy fence of about four feet in height and eighteen inches of untethered fencing at the top can do the trick. While this fencing may not be glamorous, it will flop back on the animal preventing them from climbing over. As with rabbits, a wide apron of fencing with the edges buried will keep them from digging under. This entry was posted on Friday, June 8th, 2018 at 11:28 am. Both comments and pings are currently closed.